I have a secret to share with you. It's more like a confession. I feel like I've mislead you especially since I've posted multiple recipes on this one particular food group. Come in close, closer...I really don't want this to spread around the Internet but I really don't care for ice cream. I can think of twenty other things I'd rather eat than ice cream. Let me repeat that... I really don't care for ice cream but I love making ice cream. The work is relatively easy and the payoff is huge. I get smiles every time I say I'm making ice cream. All I know is that ice cream is magic and a fun way to bring out your inner mad scientist. There they were sitting on the counter. Bananas. Spotty almost completely brown... four of them muttering, "What?!!! We ain't good enough for you?" I was a little taken aback. There are never bananas left on the counter, I didn't know they could even talk. But there they were ripe with possibilities (ba dum dum dum). I thought maybe I could make some banana bread, banana pancakes, or some type of cookie. Before I could even get out the measuring cups, Katie came up with the idea she was going to make roasted banana ice cream and was that okay with me. What's a mom to do but say yes even with her hopes of banana bread dashed? 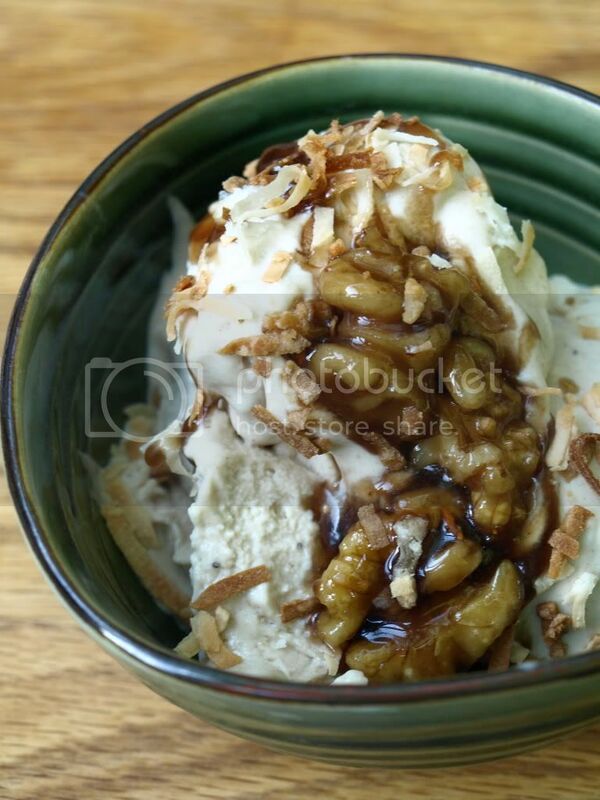 I said okay but what about some walnut praline and some toasted coconut for toppings? She agreed. Slice the bananas into 1/2 inch pieces and toss them with brown sugar and butter in a 2 quart baking dish. Bake for 40 minutes, stirring just once during baking, until the bananas are browned and cooked through. Scrape the bananas and the thick syrup in the baking dish into a blender or food processor. Add the cream, sugar, vanilla, lemon juice, and salt, and puree until smooth. Mix the water, sugar, and walnuts in a large, heavy-duty skillet. Put the pan over medium to high heat and cook, stirring constantly with a wooden spoon, until the sugar dissolves and the liquid boils. Lower the heat to medium and continue cooking and stirring for just a few minutes, until crystallizes and becomes sandy. Very soon the crystals of sugar on the bottom of the pan will liquefy. Stir the dark syrup at the bottom of the pan over the nuts to coat them. Continue to stir the nuts and scrape the syrup over them until the walnuts are glazed and become a bit glossy and shiny. Remove the pan from the heat and sprinkle the walnuts with the salt. 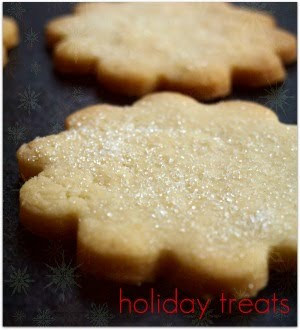 Tip them onto an ungreased baking sheet and allow them to cool completely. As they cool, break up any clusters that are stuck together. How We Served This Ice Cream: We didn't let the praline cool all the way down. 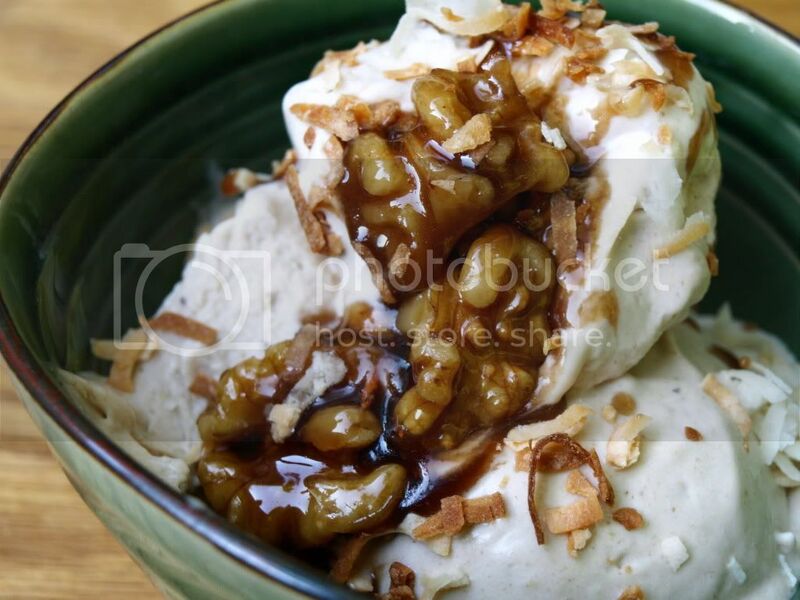 We spooned the praline warm, with the syrup on top of the ice cream and sprinkled toasted coconut over the praline. Gawgeous. I lurve it. And I DO love ice cream. So you can make it and I'll eat it. How about THAT arrangement. Mad Scientist? You "...call yourselves mad scientists? What good is science if no one gets hurt? You're not mad scientists. You're a buncha hippies with your moccasins and your warm fuzzy nice nice." Quick. What am I quoting? That ice cream (and the one from Sunday) is making my mouth water. How can you not love ice cream? How?? You're making my head hurt! Oh well...more for me..and Katie. My mouth is watering. Good thing I have a batch of chocolate ice cream from the Perfect Scoop thawing on my counter to dish up in moments. Otherwise I would be knocking on your door! Yum. You like making ice cream; I am an ice cream freak. I think we can be friends. Like I said before, you're killin' me with these ice cream recipes! I never even eat dessert and my mouth is watering just reading this. As a kid, my favorite ice cream was Baskin & Robbins Pralines and Cream and this reminds me of that...except even better, with the addition of banana and coconut! I'll make this as soon as I get the ice cream maker...Oh, and thanks alot...I probably won't fit into a swimsuit this summer! Forget the ice cream (which I don't like anyway) and give me the pralines! Holy moly rocky, those sound awesome! Okay seriously, that is just against the law to post this. What a way to use the naner...good one. meanwhile, i love ice cream and the variety it offers. this particular variation is stupendous, from the awesome bananas to the AMAZING praline. and who doesn't love a little toasted coconut? what a great post! 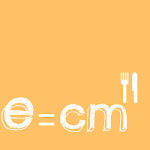 this sounds really delicious...i wanna try it...right away i'm gonna get the ingredients from www.myethnicworld.com and try it..gigantic photos. This is absolutely everything I had hoped and prayed it would be. If you come see me, I'm going to make you make ice cream. My children will worship you. Now I believe it. You truly are evil. Not only do I have to buy an icream maker, I have to come to terms with being overweight for the rest of my life. I love icecream - about once every two months. Seeing as I'm not a banana fan, don't love walnuts and that The Boss loathes coconut, we probably won't be making this one, but I agree with everyone else - it looks GORGEOUS. OMG YUM!!!! I can already hear the ooooooo's and aaaahhhhh's and mmmmmmm's if I make this!! Please stop with the ice cream recipes. I beg you. I don't buy it because I have no will power and eat it directly out of the carton. I have held off purchasing an ice cream maker because I would, most probably, start to gain weight exponentially with its use. The strawberry-sour cream-brown sugar ice cream recipe had me in my car on the way to BB&B for an ice cream maker, but I stopped myself. And now you go and post this? Why oh why are you doing this to me? Wow, I really need to make some ice cream, holy cow! Really? You don't really like ice cream? That's cool. More for me. Wow! I love to make ice-cream and your pictures are making me drool. It's funny you say you don't like eating ice-cream as well as other things. I feel the same way, but not when I see this picture! Well, I'LL BE! I thought I was the only one who didn't love ice cream. Good to know I'm not alone! But that, indeed, does look quite delicious. I just finished putting a batch into the fridge to chill and I can tell it's going to be awesome! 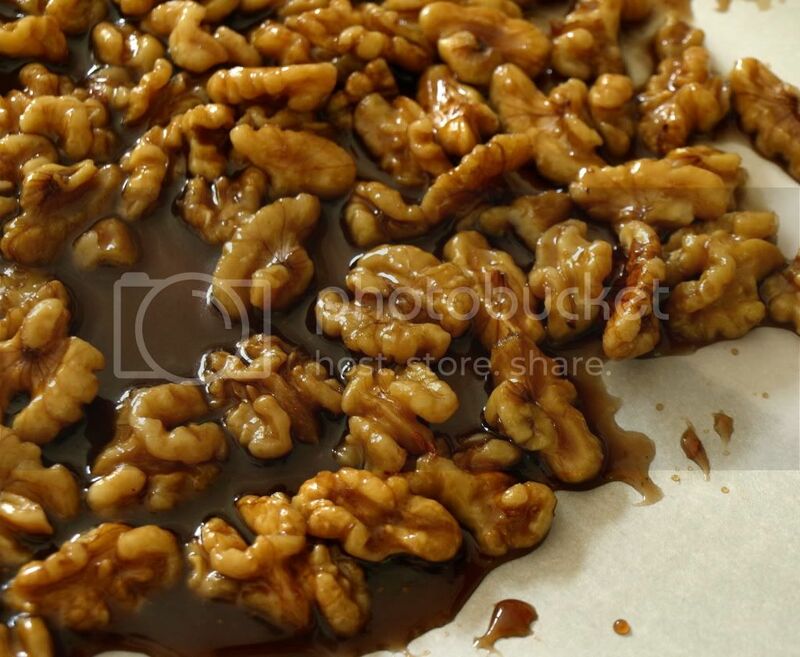 The glazed walnuts are made already and I'm going to crunch them up and add during the last few minutes of churning. That is, if I can stop eating them! David Lebovitz has so many good recipes and I'm buying his book because I keep finding new ones on the Internet, but I know there are many more to be discovered in his book, The Perfect Scoop. What fun!